Upon hearing the tragic news about an officer feloniously killed in the line of duty, many people automatically assume that the offender used a firearm. And, in most cases, this holds true. 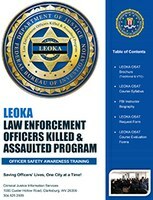 Training instructors for the FBI’s Law Enforcement Officers Killed and Assaulted (LEOKA) Program regularly review data and read reports about incidents that resulted in the deaths of law enforcement personnel. Recently, they took a closer look at the weapons used by offenders to kill officers. As expected, of the 505 officers murdered from 2005 to 2014, most (466) were killed with firearms—343 with handguns, 84 with rifles, and 38 with shotguns (see table 29). However, these figures revealed a surprising second-most leading cause of felonious deaths—vehicles. Trainers and staff use LEOKA data to shed light on officer safety issues and then share their findings with officers. Ultimately, they strive to increase officers’ chances of survival. After examining the data and reading the summaries of the incidents during which an offender killed an officer with a vehicle, the instructors discovered an increase in positional risk. Criminals killed 30 law enforcement personnel with vehicles in this 10‑year period, almost as many as the number of officers (38) murdered with a shotgun. By comparison, offenders killed two officers with a knife or other cutting instrument during the same time frame, a significantly lower number than those murdered with vehicles. Clearly, every year perpetrators who possess the same intent to kill as those who use firearms or knives use vehicles to kill officers. Mr. Philip D. Wright, a retired West Virginia state trooper, is an officer safety awareness training instructor with the FBI’s Law Enforcement Officers Killed and Assaulted Program. 1) Offender Intentionally Struck Officer: Of the 30 incidents, 10 officers died when struck by vehicles while outside their patrol vehicles. In most of these cases, officers stood directly in front of the offenders’ vehicles, attempting to stop them from proceeding. 2) Deployment of Tire Deflation Devices (Spike Strips): Vehicles killed nine officers attempting to deploy spike strips as offenders approached at high speeds. In these incidents, offenders avoided the spike strips, intentionally steered toward the officers, and struck them while accelerating. 3) Offender Intentionally Crashed into the Police Vehicle: Seven officers died when the offender drove the vehicle at high speed directly into the driver’s side door of the police cruiser. In most of these cases, officers’ cruisers were positioned on the side of the road, awaiting the arrival of the pursued vehicle. 4) Officer Held onto the Offender/Vehicle: Three officers died when they held onto the offender or the vehicle while the individual attempted to drive away. In these three cases, the perpetrator steered the vehicle to side-swipe trees, guard rails, or other objects with the intent to kill the officer. One officer died in a similar way while transporting an offender with a mental illness to a shelter. During the drive, the perpetrator grabbed the steering wheel and intentionally veered the police vehicle into an oncoming car. As the adage says, “If it’s predictable, it’s preventable.” LEOKA data collection enables instructors to identify trends that demonstrate existing problems. These trends provide invaluable insight that can help law enforcement personnel create officer safety training and departmental policies. The question becomes, If we know that offenders use vehicles as weapons to kill officers every year, what can we do to reduce the risk? Of note, in the summaries of the 30 cases studied, nearly all of the officers killed positioned themselves in front of or ahead of the offender’s vehicle, essentially making themselves targets. When officers receive an emergency call concerning a person with a firearm, they know the proper procedure is not to arrive on scene and position themselves directly in front of the weapon. However, when conducting high-speed pursuits and deploying tire deflation devices, all too often officers position themselves in front of the “4,000-pound bullet.” This type of positioning makes officers a target to someone on a mission to maintain freedom at any cost. The research study In the Line of Fire shows that one-third of the offenders who assaulted or attempted to kill an officer did so regardless of precautionary measures taken by the victim.2 The study also revealed that two-thirds of the perpetrators looked for an opportunity to assault or kill the officer to gain their freedom.3 Officers killed by an offender’s vehicle faced the two-thirds looking for that opportunity. Because the officers positioned themselves and their cruisers in front of or ahead of the offender’s vehicle, the opportunity arose. Agencies train their personnel to seek cover whenever possible when they encounter an offender with a firearm. When dealing with a perpetrator holding a knife, officers likely follow the 21-foot rule and use less lethal options (if possible) to gain control of the situation. When officers face a vehicle traveling in their direction at high speed, what options do they have to mitigate this risk? How can agencies train officers not to become the “opportunity” for offenders in vehicles wanting to maintain their freedom? Officers cannot always predict the dangers they will face each day, and each of them must maintain a focus on safety as they do their jobs. However, through the collection of data, research, and instructional services, the Law Enforcement Officers Killed and Assaulted Program can alert officers to identifiable trends and train them to recognize threatening situations. LEOKA instructors hope that as officials read the results of this research, they can develop training and scenarios to better prepare law enforcement professionals to prevent or survive encounters involving vehicles used as weapons. Arming officers with this knowledge will prepare them to react accordingly and return home safely after each tour of duty. 1 U.S. Department of Justice, Federal Bureau of Investigation, Criminal Justice Information Services Division, Law Enforcement Officers Killed and Assaulted, 2014, accessed March 16, 2016, http://www.fbi.gov/about-us/cjis/ucr/leoka/2014. 2 Anthony J. Pinizzotto, Edward F. Davis, and Charles E. Miller III, U.S. Department of Justice, Federal Bureau of Investigation, In the Line of Fire: Violence Against Law Enforcement (Clarksburg, WV, 1997), 30. 4 Anthony J. Pinizzotto, Edward F. Davis, and Charles E. Miller III, U.S. Department of Justice, Federal Bureau of Investigation, Violent Encounters: A Study of Felonious Assaults on Our Nation’s Law Enforcement Officers (Clarksburg, WV, 2006), 66.